Question C-10-2: What is a 'quality scenario'? Quality scenarios document required quality attributes. They help to describe required or desired qualities of a system, in pragmatic and informal manner, yet making the abstract notion of “quality” concrete and tangible. 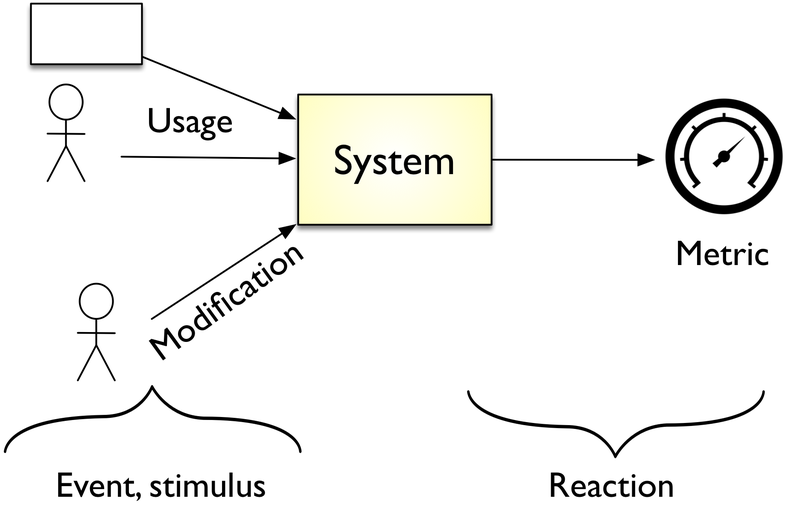 System (or part of the system) is stimulated by the event. Response: The activity undertaken after the arrival of the stimulus. Metric (response measure): The response should be measurable in some fashion. Usage scenarios: The system is used (any use case or system function is executed). Such scenarios describe how the system behaves in these cases, e.g. in terms of runtime performance, memory consumption, throughput or similar. Change (or modification) scenarios: Any component within the system, its environment or its operational infrastructure changes or is being changed. Failure scenarios: Some part of the system, its infrastructure or neighbors fail.